As one obligation was almost fulfilled & leading to others that now shift to the home front, I received news of my Uncle’s passing. He fought a years-long battle with cancer, and I returned home 3 days later to be with family for the service. This mix of sad with happy occasions has taken me home far more often than in previous years. Unplanned trips, especially those of the quick variety disrupt daily life. This one did that but has also brought me closer to what matters; who matters. It allowed for hand-delivery of a baby Aviatrix hat for F, and even good sock knitting time on the plane. In between it all, I took some pictures when it wasn’t raining & I was the only one up. Looking out from my favourite spot. 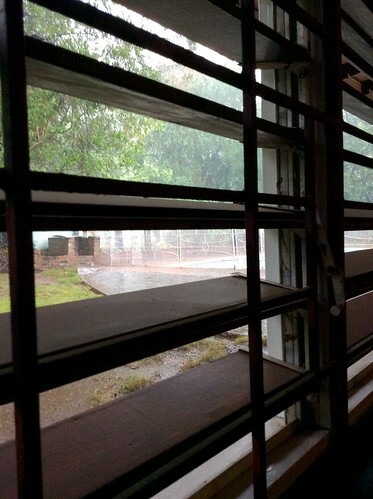 I was thinking about the day ahead & this rainfall that I can’t describe but always miss. 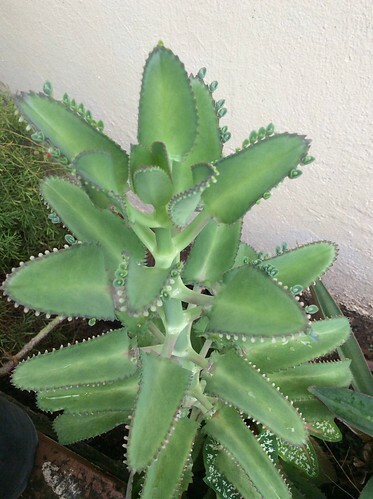 Heavy, tropical, and needed after long drought. This is 1 of 2 mature Lignum Vitae trees in the backyard. 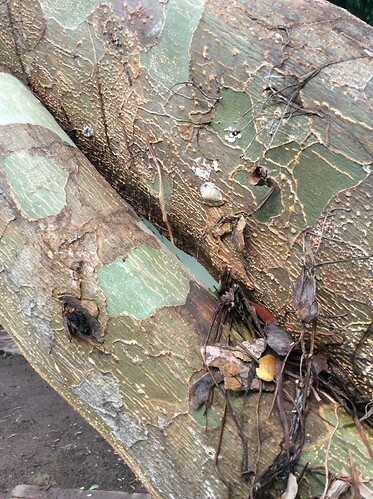 Its branches and bark support plenty in the way of insect & plant life. These trees grow the heaviest, densest wood in the world, and I love them. The second Lignum Vitae now supports a small potted orchid. Whoever put her there had a good idea. 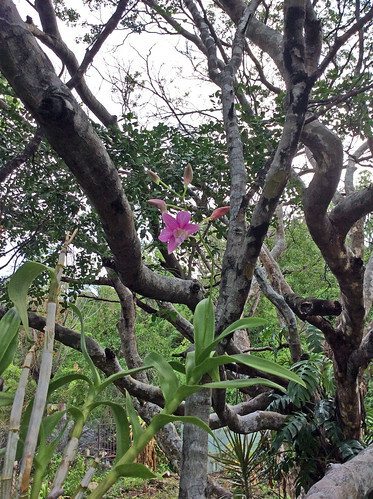 You can’t see but a weaver set up her web in between the orchid’s spikes and the tree’s branch. As weavers are wont to do. 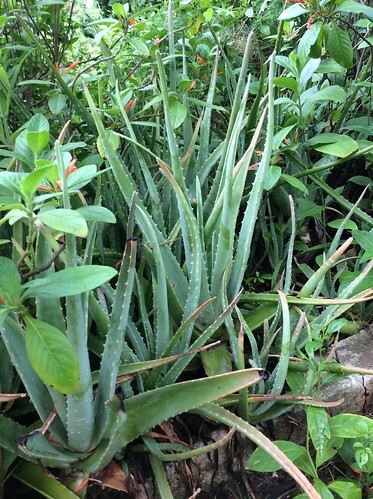 The Aloe Vera plant is also called ‘Single Bible’ in Jamaica. It has naturalized in this corner of the garden, and I gave them some encouraging words for keeping up the good fight. A splash of colour is doing well against the wall. These exceeded expectations in the long dry season, and made me smile. Also, purple. 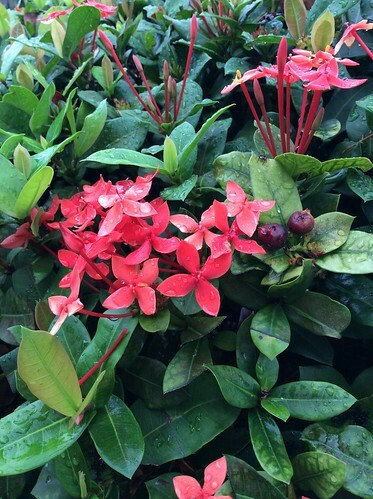 Last but not least is the flowering Ixora Coccinea bush. She has tolerated the drought and displays some fortitude! 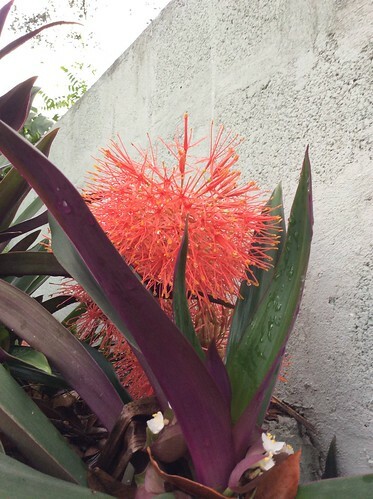 Categories: Holidays Happen, What I'm up to | Tags: Flora, Jamaica | Permalink.